North Central’s Recording Artist major will prepare you to pursue your love for music and your calling as an artist. You’ll develop your musical talent by participating in ensembles and worship teams, fortify your faith in our spirit-empowered community, and learn the skills and knowledge you need to be successful as a recording artist. Plus, North Central’s state-of-the-art facilities will give you opportunities to gain hands-on experience with the latest performance and recording technology. 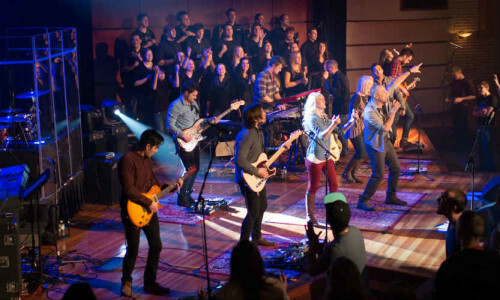 North Central’s performance groups, ensembles, and worship teams are known locally and nationally for their vibrant, dynamic worship, talented musicians, and passionate, spirit-filled ministry. From premiere touring performance group One Accord, led by renowned singer/songwriter Jeff Deyo, to chapel teams like Worship Live, we offer opportunities for students to express their love for God, pursue their love of music, and lead music ministries on campus and in the community. To ensure that you’re prepared as an experienced, highly-skilled musician, we have a few extra requirements for our Recording Artist majors. All students must complete the General Education Core and Christian Studies Core. General electives may be added or an optional minor may be selected. You need 124 total credit hours to complete the Recording Artist degree.